As a new food blogger, I am starting to understand the importance of the food picture. It’s equally important for the food to both look good and taste great for people to be interested. When I saw the pictures of the braised carnitas at The Culinary Chronicles, I wanted to try making this right away. Her pictures are so delicious, aren’t they? I followed her recipe exactly but the only changes I made are the amount of meat (3 lbs instead of 5), the brand of beer (Sierra Nevada instead of Fat Tire), and cooking time (1 hr shorter than her recipe). It takes several hours to prepare, but most of cooking time is baking in oven. What a great weekend menu, right? FYI, this is the recipe that I told you I wanted to share with you maybe about 2 weeks ago. My focus on this blog is still Japanese food but please allow me to share non-Japanese food once in a while, especially the ones that my family and I really enjoyed. Also in Japan, the Japanese eats a lot more Westernized meals at home or restaurant than you probably guessed. Lastly, Giulia from Alterkitchen passed me wonderful awards*. Thank you so much Giulia! She is an Italian living in Italy. So you know what she’s posting on her blog, REAL authentic Italian food! She’s working so hard to translate her Italian recipes into English, for us! 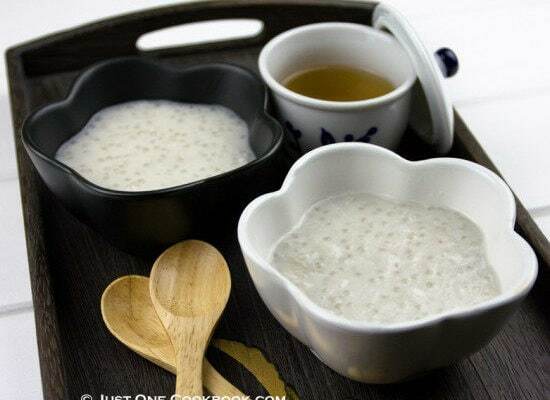 It’s not so easy to write recipes in a 2nd language, so please kindly visit her site and say hello! She’s a very charming girl and she’ll be happy to hear from you. As a new food blogger, I am starting to understand the importance of the food picture. It's equally important for the food to both look good and taste great for people to be interested. 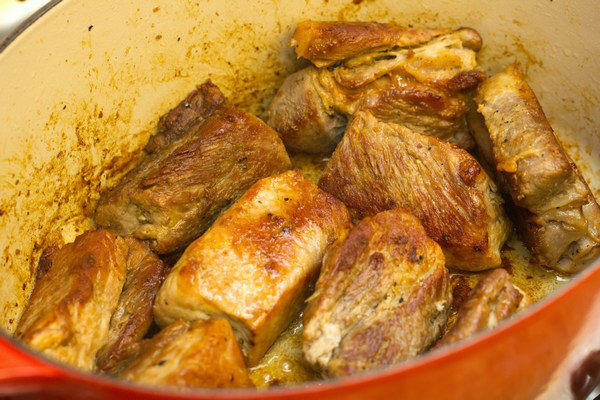 When I saw the pictures of the braised carnitas at The Culinary Chronicles, I wanted to try making this right away. 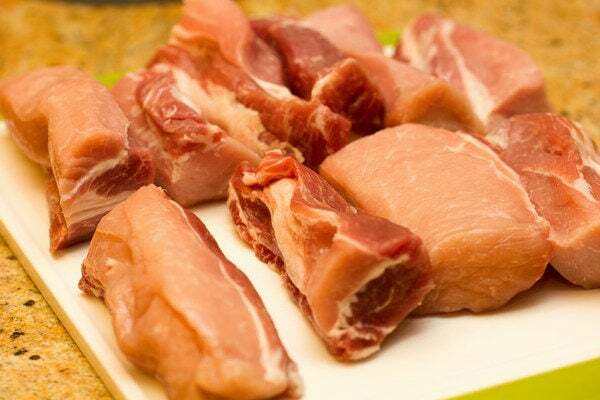 Cut the meat into 5-inch chunks and generously season with salt and pepper. In a large Dutch oven, heat oil on medium-high heat. Place the pork in a single layer without overlapping each other (you might need to do a 2nd batch depending on your meat and pot size). I put 3 lbs pork in a 3.63 qt Dutch oven and it just fit. Cook the meat till brown. Try not to flip too much and make sure each side of the meat is well-browned (it took me 40-45 minutes). Don’t worry about burning the bottom of the pot because we’ll scrape it off nicely with beer later on. When the meat is all browned, take it out onto a plate and set aside. 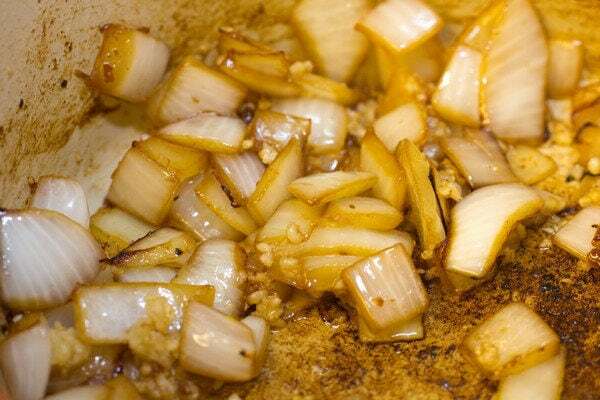 Use a paper towel to blot away some oil leaving just enough to cook onions. 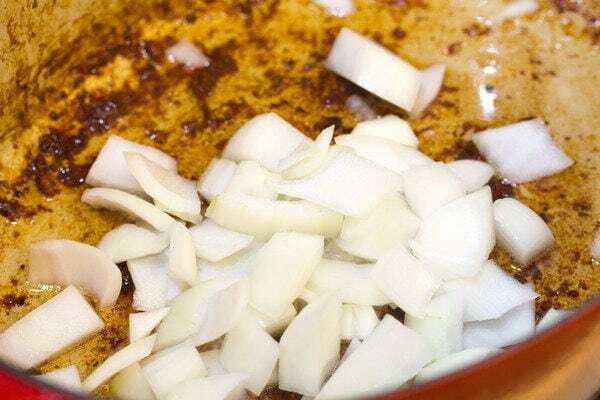 Lower the heat to medium and add the onions to the pot. 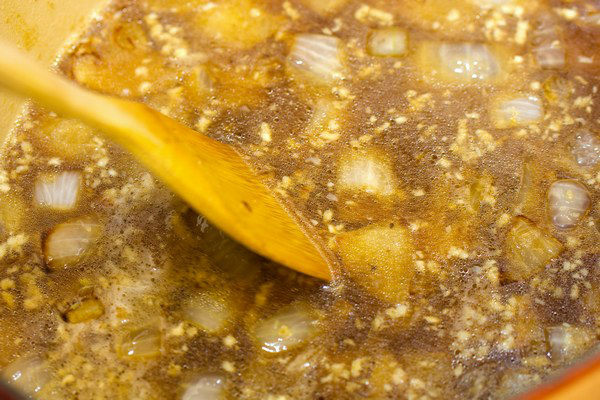 Sauté onions until translucent and then add garlic to cook 2 more minutes. Again don’t worry about burning the bottom of the pot (it’s going to be okay!). 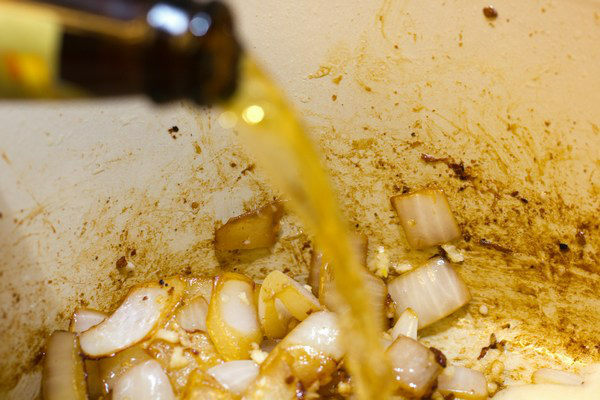 Pour in the beer, scraping the bottom of the pot with a wooden spoon to release all the brown bits. Add the pork back to the pot and add Seasonings. 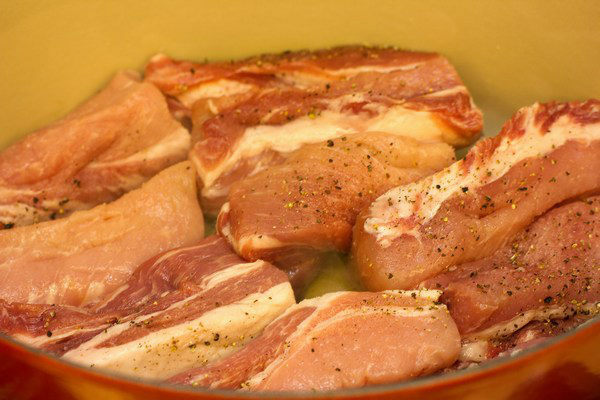 Braise in the oven uncovered for about 2½ hours (varies depending on oven), turning the pork every half an hour during cooking. 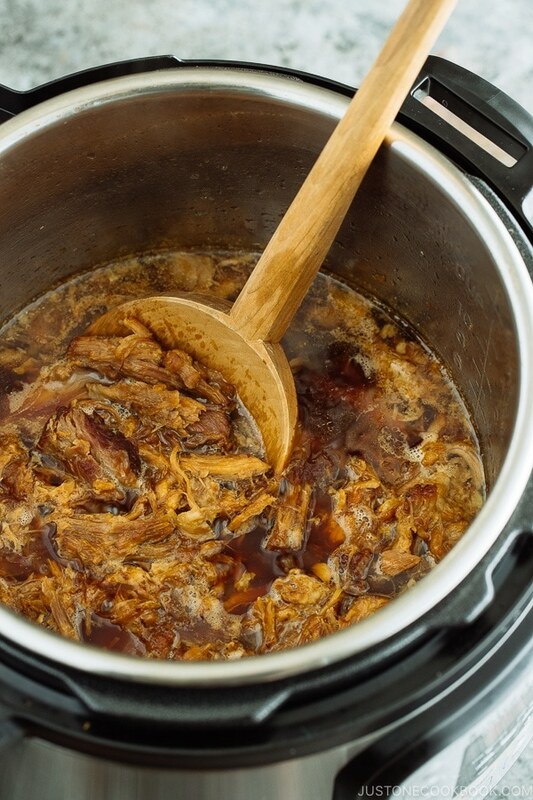 When much of the liquid is evaporated and the pork is falling apart, remove the pot from the oven. Take the pork pieces out to the plate so they will cool down. When the meat is cooled down, shred them into bite sizes with your hand. 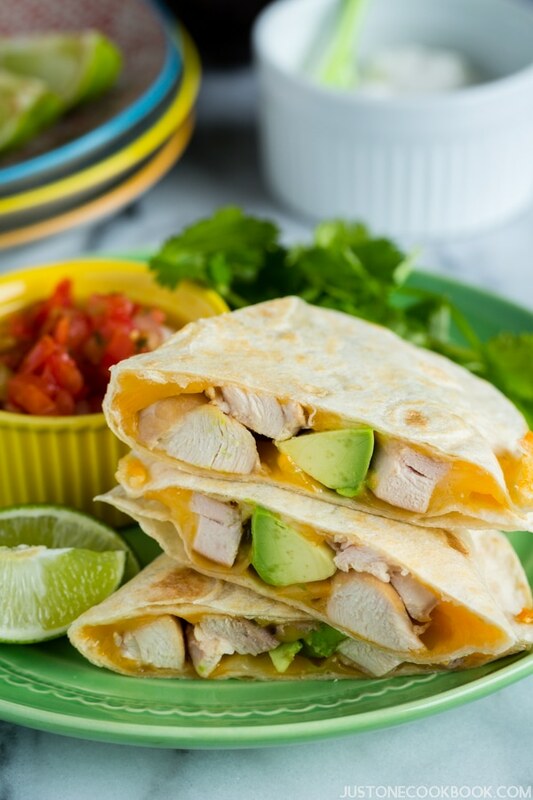 Serve with corn or flour tortillas and your choice of salsas and toppings. Slightly adapted from The Culinary Chronicles, originally from David Lebovitz. How delicious this must be, Nami. I love long slow braised dishes because the taste is worth all the wait. 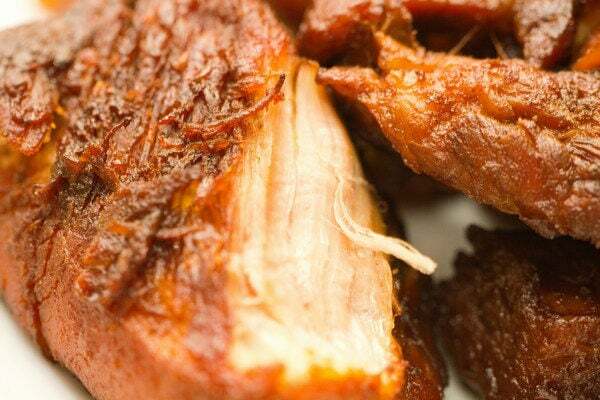 Your carnitas look so yummy I want to eat my screen 🙂 I love pork and even more slowly cooked pork (I have posted some time ago the Chinese recipe I prepare very often-spare ribs braised in soy sauce and star anise, probably our favourite pork dish). 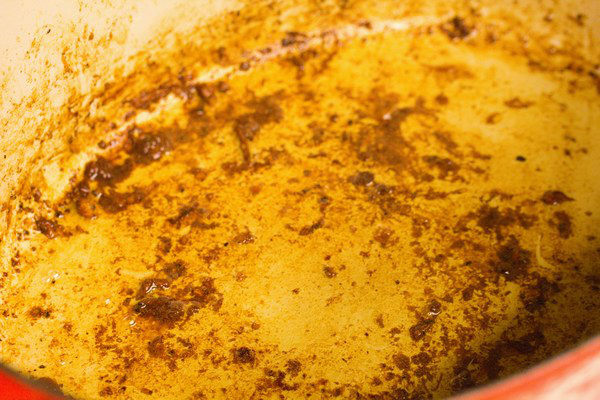 Long braising or baking makes miracles (and usually is so easy)! I am very glad you put all the recipes your consider worth sharing with us, not only purely Japanese. Thanks for sharing the links, I have already bookmarked them. They look very interesting! I agree that pictures totally make the blog for food blogging! Thanks for sharing. 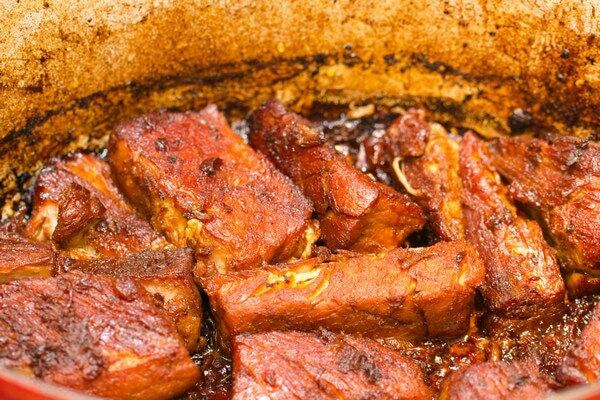 I love braised pork and usually cook Asian style. 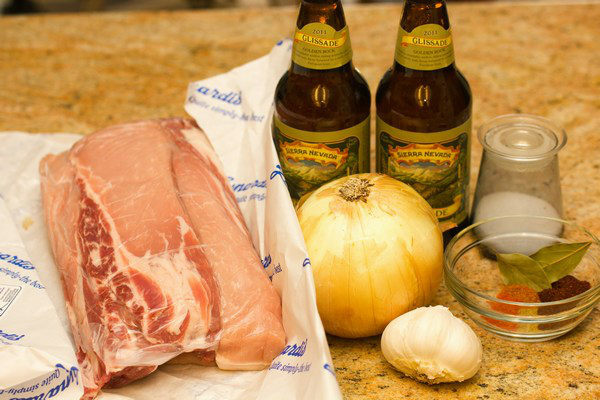 I never tried braising in beer though I drink beer with my Asian braised pork. Its not the same I know:) Have a wonderful day. I love pot roasts, and this one looks amazing! But I’ve never cooked with beer. My mom made a beef stew with beer for her birthday last year, and it tasted awesome. I don’t drink beer, but I wish to try out one day. Have a nice weekend ahead. Wow Nami, what a beautiful pictures, top 9 for sure!!! I am loving this recipe! I love carnitas! I’ve never made it in the oven (only the slow cooker). I love making things with the left overs too- carintas pizza! or even just with gohan! Hi Lindsey! I don’t have a slow cooker, but since I’m staying at home most of the time I thought I don’t need one. It looks really convenient though. Carnitas pizza sounds wonderful! WOW Nami! This looks fantastic! 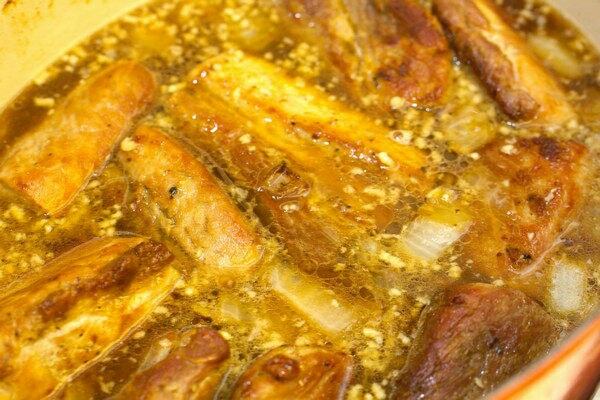 I’ve never cooked country pork ribs before – honestly, I didn’t really know what to do with them! But, I am making this FOR SURE!! 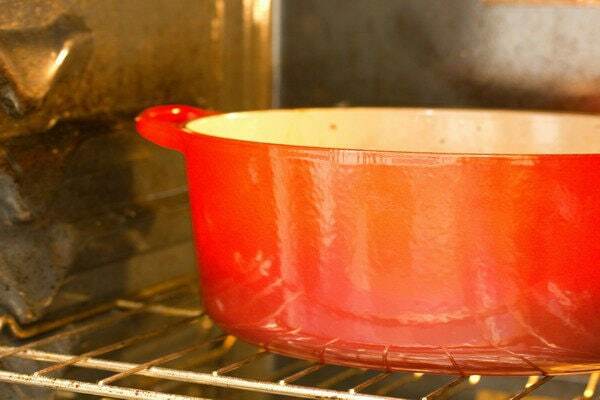 It looks easy – gotta love those dishes that you put in the oven for hours! This actually looks like a great dish during the week for my hungry family!! Nice job! Thank you Carina! Country pork ribs is same as pork shoulder. I feel like you have the recipe using pork shoulder, no? I know I’ve seen your roasts etc and they always make me hungry! Hi Mika-san! Haha… then that will be so much work and no fun. I actually feel overwhelmed with just managing single blog… LOL. 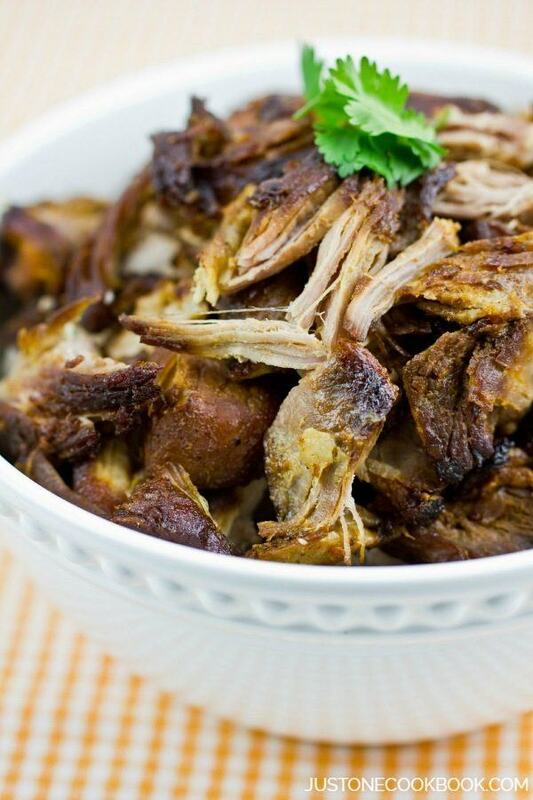 There really isn’t anything like carnitas. So tasty and lovely with tortillas and fresh salsa. Lovely photo and the step by step is wonderful. You always know how to break down the steps for people. I can’t wait to try these. Have a great weekend with your family! Thank you Terris! Well, I usually can’t remember the directions that are long…so the break-down steps are especially for me. 😀 I like it when I can put check mark next to it when I’m done, so it works the same way for directions…. LOL. These look so wonderful.I like such hassle free recipes with slow cooker.And the flavor that slow cooking infuses.Wonderful looking! Thank you Tanvi! I know… we can do other stuff while cooking the meal. I like American oven… it fits a huge Dutch oven! Nam, THANK YOU for giving an opportunity to cook this recipe and my family enjoyed it so much! Yummy! Can’t wait to give these a try! Hi Manu! Haha thank you, and you proved my point that food photography is important. 😀 Hehehe. I hope you will give it a try! Oh I can just imagine this on a cold winter night nami! It looks so warm and hearty!! Hi Daphne! Yes and it’s great for summer party too! 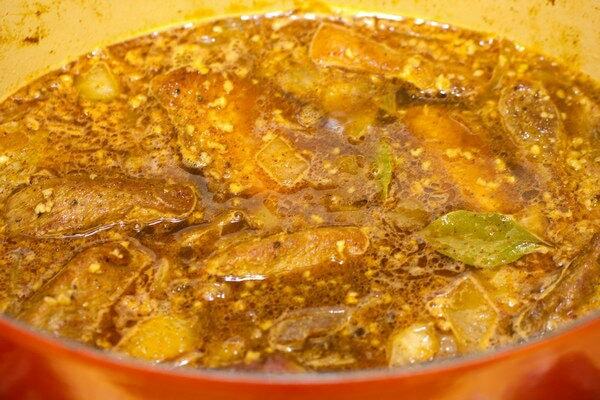 Nami, what a lovely post and great recipe. I am going to pop over now to Alterkitchen. OMG!!!! Nami the 1st and last photos was absolutely gorgeous! Very good lighting and colour combination that makes it mouth watering. Thank you Marsha! Oh of course you can make it and trust me, yours will look much better with your cooking skills! its looks yummmm! super like! This looks so good…! I love cooking meat dishes with alcohol, they always turn out yummier somehow ;). Sign me up for this one girl. Love pork dishes!! I too started blogging in Jan and withing a month I realized the value of good photography 🙂 Looking forward to see dishes from you .. japanese .. or any other cuisines you like! Now going to go over to your friend’s blog …. Yes you need a break from the usual every once in a while. What a great diversion! I love anything slow braised. Thanks Nami! I totally agree Nami..A picture can makeor break a post on a food blog.. I am working on my photography and seriously considering buying a DSLR. Hi Sawsan! Thank you for your kind words on my photography but I know there’s a lot to be improved. 🙂 Okay I will share some non-Japanese dish once in a while. Thanks for your feedback – I really appreciate it! Nami, I absolutely agree about great food photos, they just lure your readers in. Thanks also for sharing with us your photo-tutorial of this process. I also try to do it when I have the time because first and foremost, it reminds ME what to do the next time I cook the same dish! Hi Maya! You are welcome. You are right about step-by-step. I actually do it so that everyone thinks it’s easy to cook Japanese food. And hopefully my kids will think so in the future…. Thank you for the step by step photos! I think your photo is great, it certainly made me hungry, and as for the westernised food, it sounds lovely! Your pictures are great and this looks absolutely wonderful! Mmmm, great carnitas, Nami. My husband loves them, I may have to try this one out on him. Oh, my gosh! I am just drooling looking at your mouthwatering photos! What a fabulous dish! Thank you Jill! 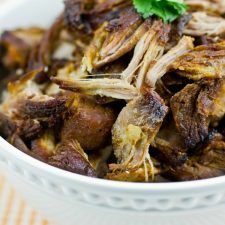 Yes…the Carnitas was so good… I have to make it again on another party occasion! Nami, your pictures are absolutely gorgeous! And that pork looks yummy good! That looks so yummy! I love this kind of food 🙂 and you made it beautifully! Sorry I’m a bit missing in action this past few weeks, I haven’t been on the computer much we are mostly at the doctors office with my husband, he is not feeling well so I’m a bit stressed lately with not knowing what is going on yet! But I’ll email you this week when I get a chance 🙂 miss talking to you! 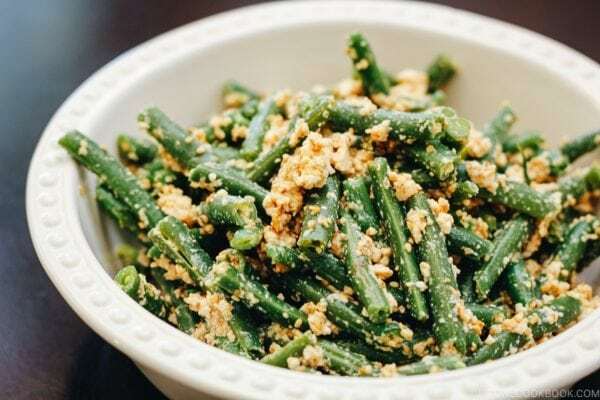 This is one of our favorite foods. We pressure cook the pork so it is really tender. Then, it can be shredded and placed on a cookie sheet and put under the broiler for a couple of minutes to make it crispy. It can also be fried in a pan on top of the stove for an even crispier carnitas. We serve ours with pico de gallo and corn tortillas. 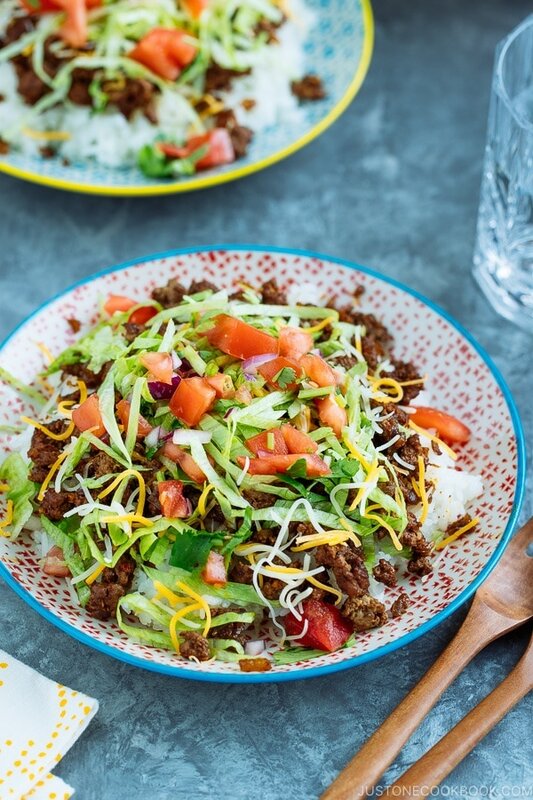 A lime wedge is often served with these tacos. Our pico de gallo consists of chopped tomatoes, green onions (green part only) and cilantro. Don’t add salt because this will draw out all the moisture in the tomatoes and make the pico de gallo soupy and mushy. Better to salt the pork instead. Seed the tomatoes for the pico de gallo and store in a sealed container and this will last for several days and not get soupy. I hope to buy a pressure cooker one day. Cooking time is a lot shorter and very convenient. Thanks for sharing! Your instructions on your website are wonderful. I love the pictures. 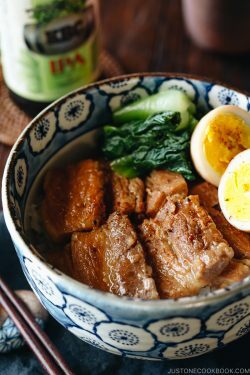 I also live in the Bay Area, but in Livermore and I am happy to read a recipe blogger from our local area because we can shop at similar places! I think I might have seen you in Mitsuwa when I was trying to select dashi ingredients and I asked you for help. 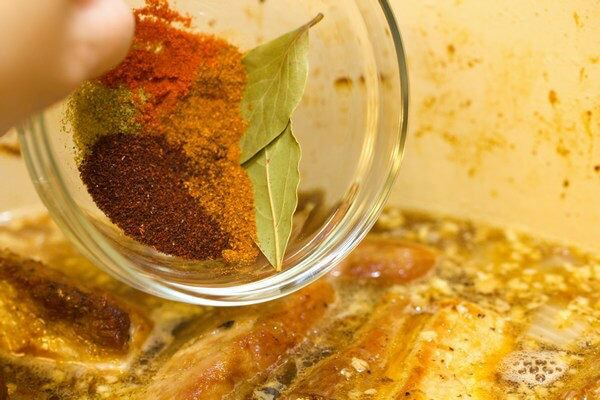 I am going to try this carinatas recipe since I found pork shoulder on sale at Safeway for 99 cents a pound today! Yes! I live in Peninsula, but we have some friends in East Bay so we sometimes visit them. Really? I haven’t gone to Mitsuwa for a long time though. Could be 2 years or more… Was it that long? Mitsuwa is a bit far from me, so I usually go to Nijiya or Suruki in San Mateo.